Universal Studios Japan THEA award! Last week during the IAAPA International Conference, Universal Studios Japan’s “Universal Spectacle Night Parade – The Best of Hollywood” won a prestigious THEA Award! They were acknowledged in the Live Show Spectacular category by the Themed Entertainment Association (TEA). Insight Productions’ set for the Canadian version of The Launch was relocated to Studio 40 in the CBC building for Season 2. The curved video walls that line both sides of the set could no longer be anchored into the floor as previously, so they needed to be supported from above with some re-tuning of the Engineering which EEI provided. News flash; shooting has just wrapped!! 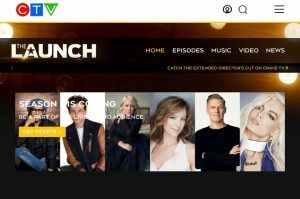 The new season is set to premiere on CTV. Check out their website for more info! Robert LePage’s vision had a spectacular extended summer run in Stratford to rave reviews. Cinematic in it’s presentation, the show relied on a unique use of automated projection screens that scrolled from top, bottom, left and right of the proscenium. They could become a full size movie screen, or act as an aperture that could be as big as the entire stage, or small enough to reveal an actor’s head. 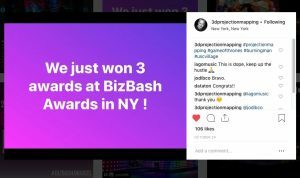 A master projection designer for over 20 years, his work for the HBO ‘Game of Thrones’ Season 7 Premiere Party, California Science Center Discovery Ball, and Shogyo Mujo: A Gem on the Burning Man Playa won for Best Use of Special Effects at Events and Best Video Capture of an Event, respectively, in the 2018 BizBash Event Style Awards, presented by concierge.com! 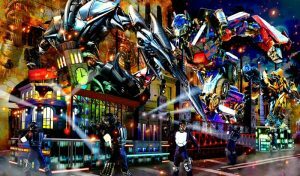 Epiphany Engineering had the privilege of working with Bart on Universal Studios Japan’s Optimus Prime float for their night time parade. Congratulations Bart! The art of Banksy exhibit came to Toronto’s Junction Triangle neighbourhood this past summer and just finished it’s extended run on August 19th. 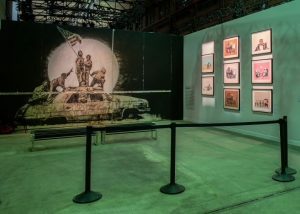 Billed as the world’s biggest collection of the street artists work. This unique exhibit obviously required an equally unique presentation space. An undocumented building with an atypical roof structure required reverse engineering to sign off on the lighting truss design layed out to showcase the huge range of scale of his work. In a truly Canadian snow covered and exciting football game, the Toronto Argonauts beat the Calary Stampeders 27 – 24 in the CFL 105th Grey Cup on Sunday, November 26th in Ottawa. 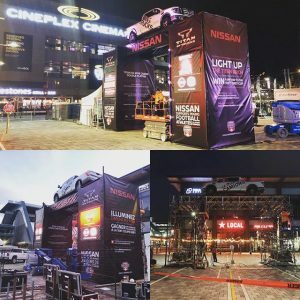 For the second year in a row Epiphany Engineering worked with Danger Boy Stunts, Rigging & Special Effects to ensure a safe scaffold and truss archway supporting a Nissan Titan truck above the excited fans in the plaza next to TD Place Stadium. We are currently working on developing our new site. The new site will include a sortable project portfolio, a comprehensive list of services, staff bios, news, and a guide on getting an engineer’s stamp. Check back regularly for updates!